When you travel to Chiang Mai in Northern Thailand, you will notice many advertisements for a jungle zipline tour called Flight of the Gibbon. During our first day wandering the city we noticed one of the ads and thought it might be something we’d enjoy doing. 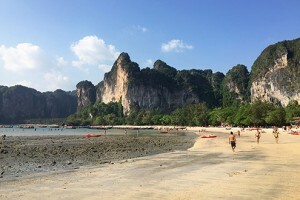 After returning to our hostel we checked out their website and instantly decided to book the ziplining adventure for the next day. Located an hour and a half drive north of Chiang Mai in Mae Kampong, the zipline course features 30 stations, 18 ziplines, and 3 sky bridges. For 3999 Baht per person ($111), a day at Flight of the Gibbon includes transportation, a meal, and of course, a few hours flying through the trees. As an eco-tourism attraction, Flight of the Gibbon donates “10% of their profits in primate re-habilitation, re-forestation projects, and ecological education programs.” If you are lucky, you might even get to see a few of the gibbons they have helped to rehabilitate, who now live freely in the very same trees you will zip between. Depending on which tour time you select, a van will pick you up from your hotel/hostel around 6:30, 8:00, 9:00, or 12:30. 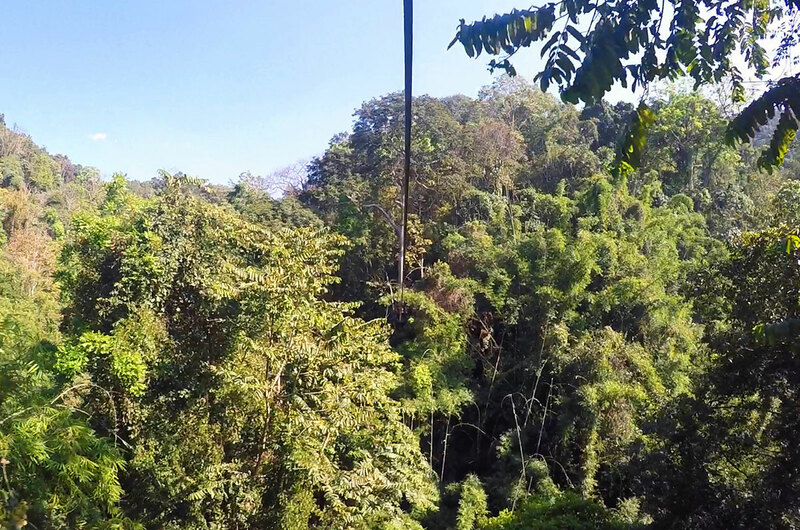 Due to the dirt roads in the mountains of Thailand, getting to the Flight of the Gibbon Zipline course is an adventure of its own. While the beginning of the ride isn’t so bad, the roads get worse the further you go. With twists and turns and many pot holes along the way it’s possible to get motion sickness on the ride. 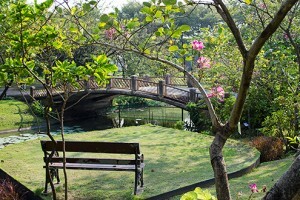 We suggest you head to one of the pharmacies in Chiang Mai to pick up some Dramamine to help prevent motion sickness. We were able to grab a 10-pack of Dramamine for 12 Baht ($0.33). Once you arrive at Flight of the Gibbon the first order of business is to fill out some forms and sign the waiver. During this time you can put your bag in a locker and go to the bathroom one last time. After that employees will help strap you into a harness and grab you a helmet (they even give you a Flight of the Gibbon bandana to wear and keep). Next you will get your photo taken wearing the gear, which they will email to you for free at the end of the day. Once everyone is ready to go it’s a short ride down the road to the beginning course. If the first thing you hear when arriving at the zipline course is the sound of people screaming in the distance, don’t be concerned. That’s just the body’s natural reaction to the adrenaline rush of flying through the air. 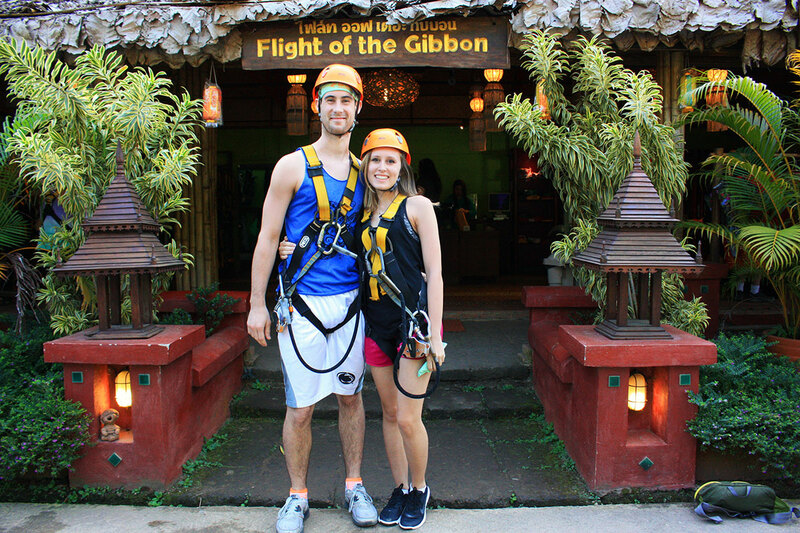 Even if you have a fear of heights there is nothing to worry about while ziplining with Flight of the Gibbon. Your harness will be securely attached to the course at all times, whether you are on a platform or flying between two trees. And even with my fear of heights, all doubts disappeared after riding the first line. 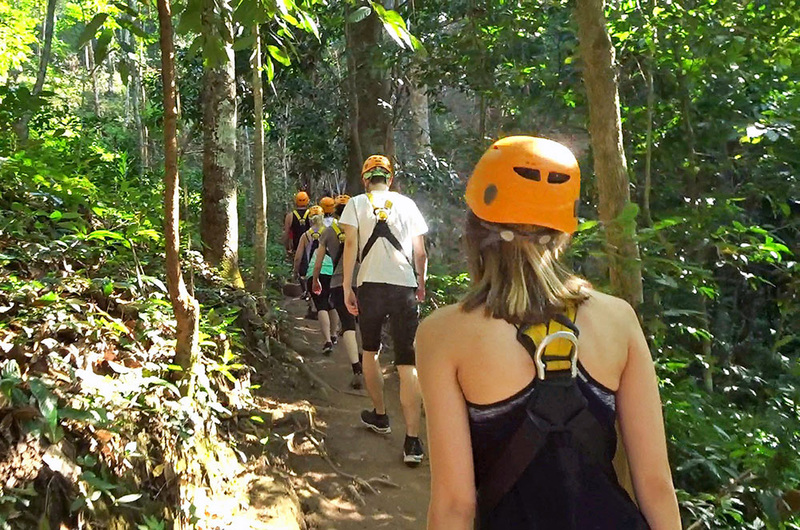 The course is a great way to see some of Thailand’s jungles, without all of the hiking. 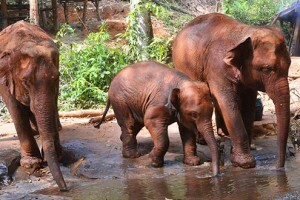 Our three guides not only made sure we felt safe, but kept things fun and a bit educational. Sometimes they would stop along the way to point out certain plants and explain to us how they are used by the local community. Overall it took us about 2 hours to complete the course. Between “trust falling” backwards off of a platform to riding the 800 meter zipline (which they claim to be the longest in all of Asia), I would say our first ziplining experience was a success. 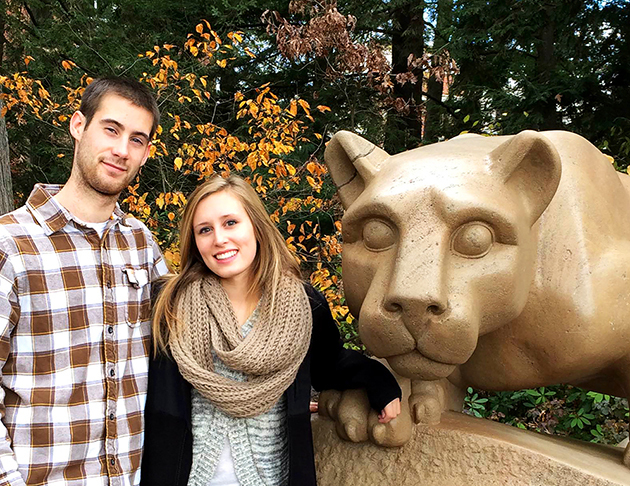 Plus, two points of the course featured tandem ziplines making it a great activity for couples! 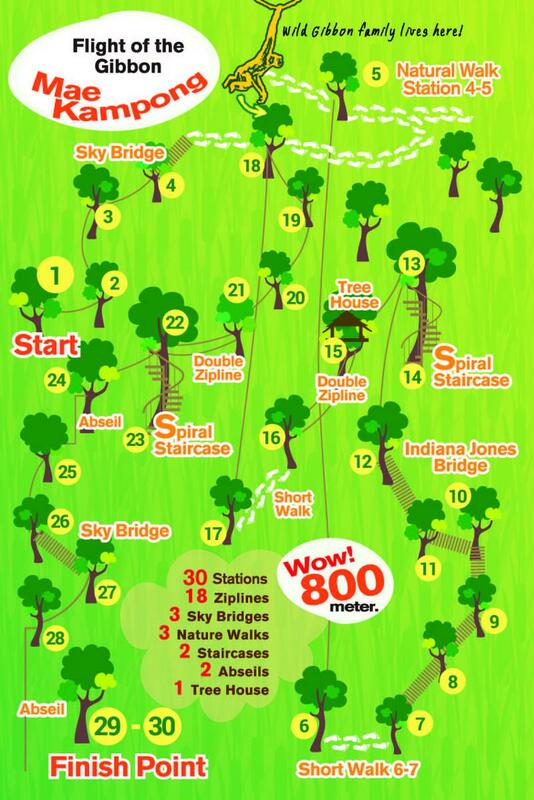 Have you gone ziplining before? If so let us know where in the world you went ziplining and how your experience was in the comment section below! wow! 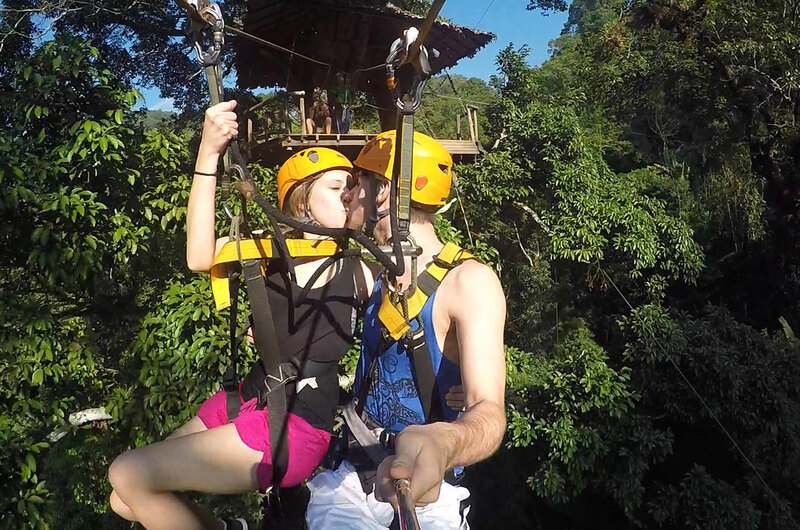 jungle zipline tour, its absolutely classical post, i love it, Brad your last pics Kissing to your partner before ziplining is really awesome..